Carbon mountain bicycle XC rims are lighter, wider and more vertically compliant without compromising strength or reliability, specially designed for riders who like to build light weight wheelset & bike for XC use, well-balanced the stiff and lightweight. Available sizes 27.5er (650b) and 29er, these rims are hookless bead and tubeless ready with channels to lock the tire bead into place, allows riders to run modern light weight and wider XC tires while reducing the risk of pinch flatting or impact damage. 650b - symmetrical rim profile - MX730XC, 30mm external, 24.5mm internal, 320g. 29er - symmetrical rim profile - MX930XC,30mm external, 24.5mm internal, 340g. 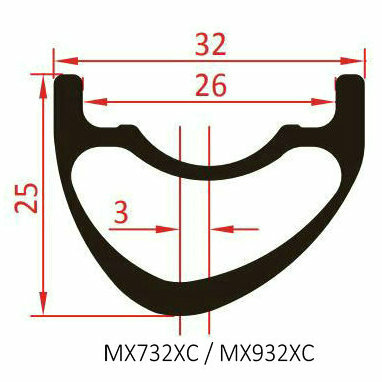 650b - asymmetrical rim profile - MX732XC, 32mm external, 26mm internal, 330g. 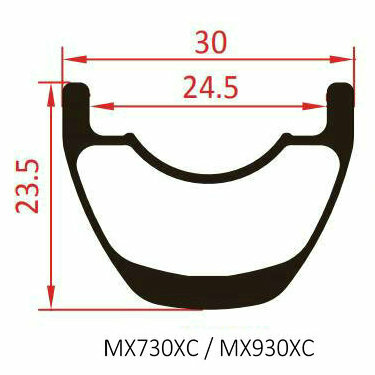 29er - asymmetrical rim profile - MX932XC,32mm external, 26mm internal, 350g. Using the impact resistant composite layer and thick hookless side walls, stiffer, stronger and more durable, these XC hookless mtb carbon rims are ready for that next challenge.